Santa Clauses and Easter Bunnies are relatively easy to find in the antiques and collectibles world. But if you want to collect and/or display vintage St. Patrick’s Day decorations, you’ll need the luck of the Irish! Aside from postcards, cardboard cut-outs, and pinback buttons, most antique shops do not have many older St. Patty’s decorations for sale. That’s why we count ourselves very lucky that we’ve been able to amass as many pre-World War II Irish-related candy containers, figures, and toys as we have. A good portion of our collection came in one fell swoop over thirty years ago when we encountered a table at a local flea market just loaded with neat St. Patrick’s Day decorations that the dealer had acquired from one family. We scooped just about every one up and had an instant collection! There are many symbols associated with Ireland and the Irish, and these antique St. Patrick’s Day decorations reflect that symbolism. The shamrock, of course, is a species of clover native to Ireland, and it often appears on St. Patrick’s Day postcards. We have a little pot of artificial shamrocks in our collection, and shamrocks decorate our clay pipe, our Irish potato candy containers, and a couple of our Irishmen’s hats. The shillelagh is a traditional Irish fighting club made of blackthorn wood. Legend has it that blackthorn hedges are home to fairy folk. 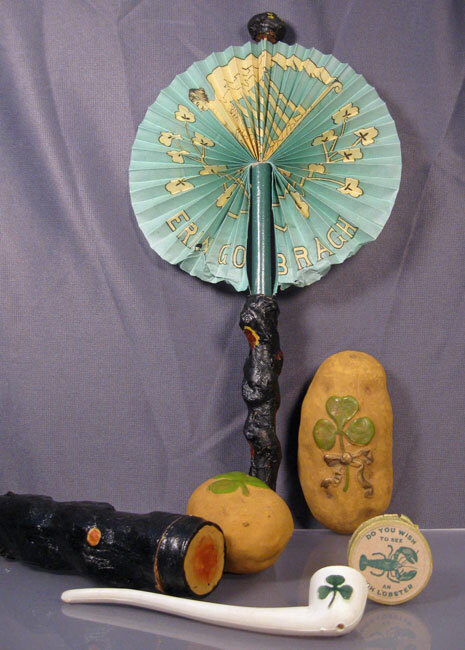 We have a shillelagh candy container in our collection and a shillelagh that opens up into a circular paper Irish flag. The national symbol of Ireland since 1542 is the celtic harp, one of the world’s oldest instruments. Celtic harps often appear on antique postcards. We also have some paper horns and a silk Irish flag that display the harp. And then there are the green pigs. While I can’t find any specific reference to Irish pigs as symbols of good luck, I did find references stating that several European cultures including the Irish considered pigs a symbol of good fortune. Pigs are often shown with four-leaf clovers for extra good luck. Because we have four green pigs in our collection, all dating from about 1915-1930, I think it’s safe to say that they are St. Patrick’s Day decorations. The typical lucky white or pink pig is turned green to honor the Irish. We also have a couple of St. Patrick’s Day postcards that prominently feature pigs as lucky symbols. The green pigs pictured here are mere inches in length and height. The largest pig is a candy container with a removable head. 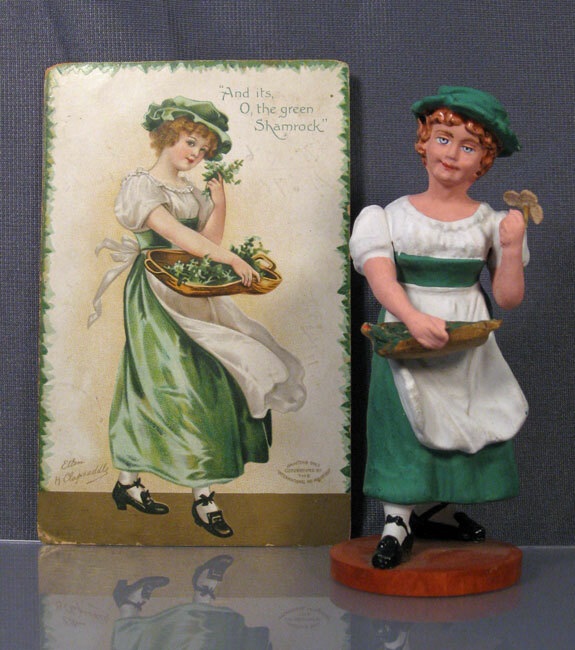 Our favorite antique St. Patrick’s Day decorations all come from that wonderful era just after World War I and up into the beginning of the Depression. That was a time when German and American factories were churning out the most whimsical little cardboard and composition holiday and party decorations. It’s very easy to picture our candy containers as part of a St. Patrick’s Day table setting. They might also have been handed out as prizes or favors at a classroom party. By that point in time, too, most Irish-Americans had been in the United States for several generations and were taking pride in their heritage. Enjoy some pictures of a portion of our collection, and good luck to you as you search for your own St. Patrick’s Day collectibles. Almost every Irishman pictured here is a candy container. A couple have removable heads. Three have space for candy underneath. One is a composition figurine glued to a little chipboard box. Only the wee green-suited guy carrying the bundle of sticks is not a candy container. 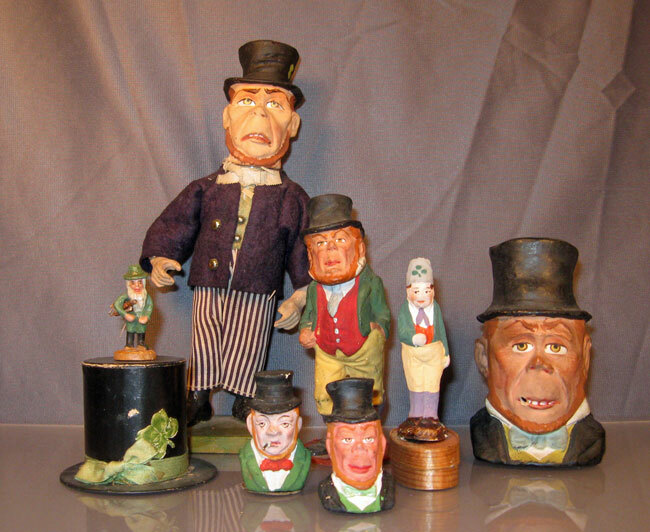 You’ll note that most of the Irishmen have red hair and a tall black top hat. And, yes, the tall black top hat made of cardboard is a candy container. Which came first – the postcard or the figure? Look carefully and you’ll notice that the composition figurine is most definitely based on the depiction of the Irish lass on the postcard. The postcard art is by well-known American artist Ellen Clapsaddle, but the postcard was printed in Germany. Clearly, German artists turned the picture into the figure. We owned the postcard for several years before acquiring the figure. The figure is in near-perfect condition with a 20-cent price tag from Wanamaker’s on the bottom. As mentioned in the article, here are our shillelagh and potato candy containers. The circular “Irish Lobster” box is a funny gag gift. When you open it up, there’s a little mirror inside. Obviously, the Irish Lobster is you! This entry was posted in 1910's, 1920's, 1930's, Americana, Carol, Holiday, Humor, Uncategorized. Bookmark the permalink. One Response to Top o’ the Morning and Happy Collecting St. Patrick’s Day to You! Awesome collection! Seeing all that green makes me giddy.